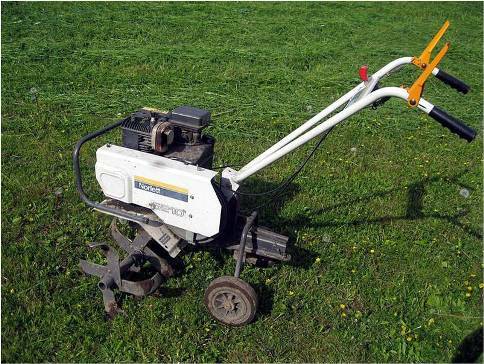 It is always better to use a front tine tiller for preparing the land for a small garden. The sizes of this machine may differ. So, you need to pick one that suits your needs and which you can handle easily. For large lands, rear tiller can be used. Use of a spade and a fork can lead to a tedious work. There comes the front tine tiller. Here, we've come up with a simplified procedure for using the front tine tiller. Plan ahead and decide the area where you need to till. Usually, it’s better to start from the corners and tilling in the long direction of the plot. Adjust the tiller to handle it better. So, first you need to adjust its height. Adjust it in such a manner that you don't have to slump your body to handle the machine. Then, adjust the depth of the front tine tiller which will enable it to till the soil in a uniform depth. You can get the best suggestions to buy a rototiller, if you are getting confused about different varieties of tillers. Most of the tillers are gas powered. So, fill it with the recommended type of gas in it. Turn the engine on by applying the choke, and turn the throttle switch, pull the start cord with one hand and the other on the handle. Wait for some time so that the engine might get warm. Whenever you need to speed up the tiller, you just need to open the throttle. It’s tough to handle or operate it while it’s at its highest speed. If the soil is hardened, it requires some strength to handle it well. Moreover, the stones will make it to divert the path and you need to control. At the start, apply your strength to engage the tines and have a firm grip over the handle. Move in a straight direction rather than where the machine leads you to. So, it's important to efficiently control the machine. Pass over a spot again and again so that the soil might get loosened to suite the requirements of the plant. Turn the engine off once you are completed with the job. Turn the throttle switch for turning it off. Then, you need to clean the dirt and debris accumulated on the machine using gloves. So, don't forget to remove the plug so that it may not start on its own while you clean. With a proper set of procedures to use the tiller, the job becomes simplified and efficient due to the right way of handling it. A dry and compact land can be turned into a smoother surface using such machines which saves a lot of time and manual labour. So, follow the instructions and prepare your land for a perfect garden. Alatnya tergolong canggih, kalau ditempat saya masih manual. Pakai arit. Dan memang terlalu memakan waktu dan tenaga.